Today most lawyers understand the role marketing plays in ensuring their firm’s long-term success. Unfortunately, they don’t exercise due diligence with it like they would with their clients. One example of this happens when an attorney decides to pursue law firm SEO instead of going with PPC. It will take months, if not years, for you to launch a new law firm SEO campaign that produces consistent results for you. On the other hand, the returns you’ll get from PPC will happen almost immediately. However, people still choose SEO because it’s shown to produce a higher ROI and give you more of a competitive advantage. Unfortunately, it’s easy to get sidetracked when you see that PPC is faster though. Once you have successful marketing campaigns working for you, it’s a good idea to pursue both options. The challenge comes in deciding which one you want to start with. When you have less than 100,000 people in your city, you’ll need to carefully consider the cost vs. reward calculation. This is especially important now that algorithms make it more expensive to rank your law firm in a large geographic area. Studies suggest that if your city has less than 50,000 people in it, PPC is probably a better option, but your firm’s practice area will also dramatically impact your decision. You should never assume that because your competition is engaging in law firm SEO, you’ll be successful if you do the same thing. There are startup costs you must consider here whereas with PPC the costs aren’t so great because you have control over your campaign’s settings and so you can easily choose who you want to target. It’s also important to consider how volatile your practice area is. This is important because there will be times when PPC will cost you more than $5K per case. You must stop to truly consider how many cases your firm is willing to lose money on before they get that big break on a major case. Law firm SEO is safer when you’re practicing in a highly volatile area, if the market potential exists. However, if your firm is targeting non-volatile areas, PPC is your best option because its return is both predictable and reliable if you understand the metrics you’re working with. Your website isn’t mobile friendly. You have a very generic website that fails to create an emotional connection between your firm and its audience. Your website’s design is outdated in comparison to your competition. You don’t have a lot of content and what you do have doesn’t offer solutions (e.g. turning to your firm for help) or provide value. Most firms are wasting half of their marketing budget but can’t even tell you which half they’re wasting. It doesn’t have to be this way though. 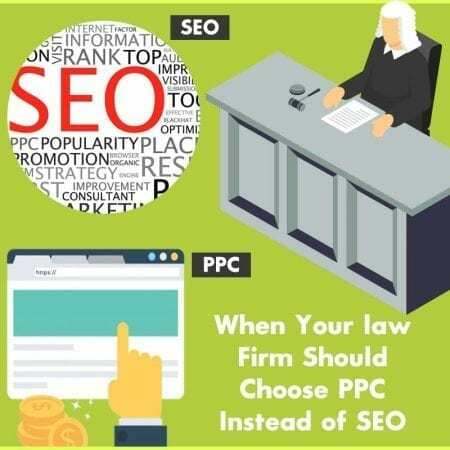 When you’re ready to get help with your law firm SEO, there’s one company you should know that you can trust and turn to: The Affordable SEO Company has successfully helped many law firms improve their SEO over the years and thus gain more clients. Your firm should be next in line to implement a successful marketing campaign.